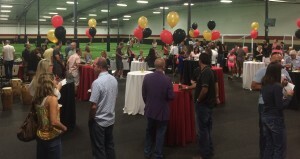 The Sports Performance Center is available to host your birthday party, corporate event, reception, watch party, you name it! Birthday parties at the SPC can be anything you would like them to be! If we have the equipment it is yours to include in your party! We can do soccer, dodgeball, and non-specific fun and games of your choice. You can come in and do your own thing or you can hire a staff coach to run the party for you! We have 2 simple packages but again we are open to anything you would like and do not have to stick to the package. Pricing may change if you are looking for something in addition to what we offer in each package. Please call our facility director Fields Brown for bookings at 919-880-7925 or email him at Fields.Brown@fcboulder.com. For larger events, we can rent out the entire building (three fields, strength/conditioning area, board room) and accommodate viewing parties with our 15 foot projected screen for live game viewing, presentations, music or other entertainment. Our building can organize liquor licenses for special events, has a personal address system and full bathroom facilities. Our 2500 square feet banqueting area can host events for hundreds of people. To make a reservation, email our facility director, Fields Brown, at fields.brown@fcboulder.com or call 919-880-7925 with any questions. Typical availability includes weekends all day and holidays throughout the year. Not your birthday? You can still rent fields for pick-up games, work social events or other functions. Email or call us to discuss!